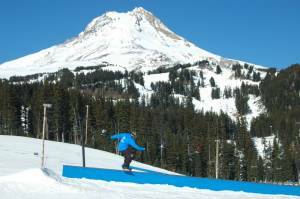 Portland, OR – A Portland area snowboarder has sued the parents of a 17-year-old who she claims was riding recklessly when the pair were involved in a collision on the slopes of Mt. Hood Meadow ski area in 2013. According to the complaint filed this week in Multnomah County Circuit Court in Portland, 32-year-old Mara Friedland was snowboarding on Meadows’ intermediate-rated Ridge Run on Jan. 20, 2013 when 17-year-old Grant Carkner of West Linn, Ore., a member of his high school’s varsity snowboarding team, struck Friedland from behind. According to the lawsuit, Friedland — a Portland area jewelry designer — suffered a traumatic brain injury, ligamentous injuries to three of her cervical vertebrae, post traumatic stress disorder, chronic headaches and problems maintaining her balance. She has asked the court to award $955,800 in damages against the teen’s parents, including $16,000 in past medical expenses and over half a million dollars for future medical care.